This more advanced puzzle will drive you nuts! BA (easy). All dots either green or yellow. Ignore directions of the arrows. BA with Honors (still easy). Same as BA solution, with slider finishing in lower right-hand corner. Masters (hard). All arrows in same direction. Ignore color of the dots. Masters with Honors (harder). Masters solution, with slider finishing in lower right-hand corner. PhD (very hard). All dots one color and all arrows pointing in same direction. PhD with Honors (hardest). 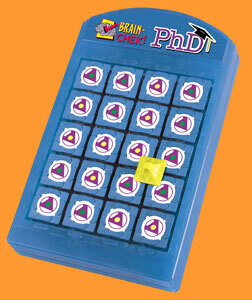 PhD solution, with slider finishing in lower right-hand corner.